You won’t be able to resist the soft, fine wale corduroy—the perfect fabric for cozy baby garments. 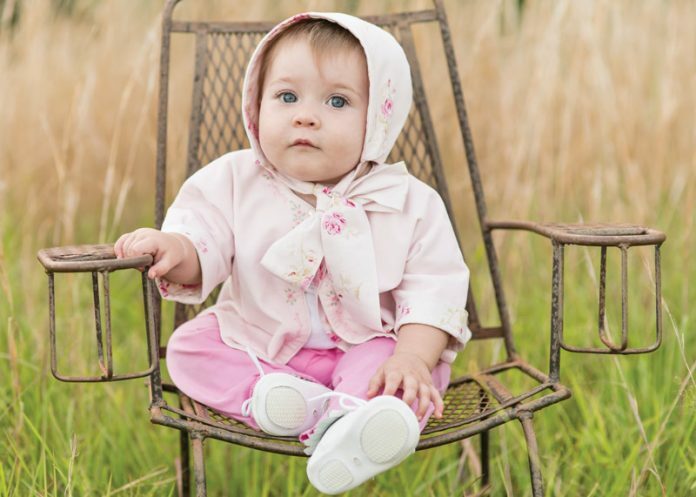 The matching pink bonnet and sacque are lined and accented with a sweet floral-print fabric and the sacque is embellished with hand embroidery using two strands of cotton floss to give it the slightly bold look that the fabric requires. Mother-of-pearl buttons add a simple touch to the bonnet. 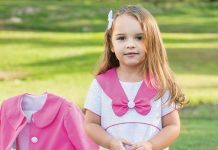 The sacque is made using the “Baby’s Sacque & Wrapper & Embroidery Designs” pattern from Jeannie Baumeister of The Old Fashioned Baby, along with the instructions included here for adding the cuffs. 1. Cut floral print fabric 33/4″ x 91/2″ for each cuff. 2. Stitch the short ends of the cuff right sides together to form a circle (fig. 1). Press seam open. 3. Stitch cuff to sleeve, right sides together and raw edges even (fig. 2). Press cuff away from sleeve. 4. Turn remaining raw edge under 1/4″ to the wrong side (fig. 3). 5. Fold cuff in half, wrong sides together and stitch the loose end of cuff to the stitching line inside sleeve by hand or machine (fig. 4). 6. Fold cuff up to the right side of sleeve (fig. 5). 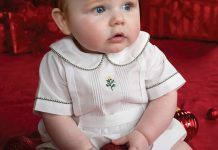 Previous articleA Christmas Romper for Baby Jack! Next articleThis Outfit Is Perfect for Spring Days That Still Have a Bit of Chill in the Air!